The Hunter 60-inch Ceiling Fan Extension Downrod is perfect for 15-ft ceilings. Ceiling height and slope are not a problem when using a Hunter extension to mount a high-quality Hunter ceiling fan. At 60", the downrod places the fan at the right spot for optimum air flow. Both ends have tapered single-thread construction for better hold when mounting the fan. 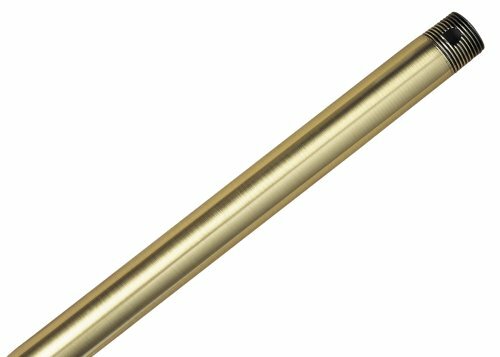 At 3/4" wide, the extension fits Hunter Original fans, this extension is designed in a modern style and has multiple finishes to match Hunter fans in the same color. It is constructed from sturdy metal for durability and is appropriate for indoor use only. Available in Antique Brass, Antique Pewter, Black, Brushed Nickel, Hunter Bright Brass, New Bronze, Provencal Gold, or White.